For awhile now, we’ve been delineating hand to foot continuities that run throughout the body, providing strength, flexibility and a more developed sense of one’s body in space as they unfold. These patterns of uninterrupted flow, created by sequences of muscle, tendon, fascia and bone, come and go with movement. We saw, last time, how motion of the hands helps create lines of pull that travel by various routes up into the torso. Our task today is to look for some of the strings that will convey these impulses from the torso down into the pelvis, legs and feet. A good place to start is at the back of the trunk. Remember that you can enlarge an image simply by clicking on it. The next two drawings provide an overview of what Myers calls the Back Functional Line. Both illustrations reveal the same continuous line of pull running across the back and linking up each hand with the opposite leg. Setting off from the left side, we begin with the left latissimus dorsi at its origin on the left upper arm, follow down to where the tendons of the latissimus merge with the thoracolumbar fascia, cross the midline over to the right gluteus maximus on the other side, travel with the right vastus lateralis as it passes along the outside aspect of the thigh, and end up where the vastus lateralis inserts onto the right tibia just below the knee cap. If we had started with the right latissimus, we would have ended up at the left tibia. These two potential lines of pull crisscross the back of the torso to form an X. I use the word “potential’ because we can choose to either engage these lines or leave them dormant. Other links carry the line eventually to the foot but you get the idea: myofascia working together with bone to form a continuous chain. Now, let’s examineelements of these back lines in a little more detail, starting with the latissimus dorsi and thoracolumbar fascia. 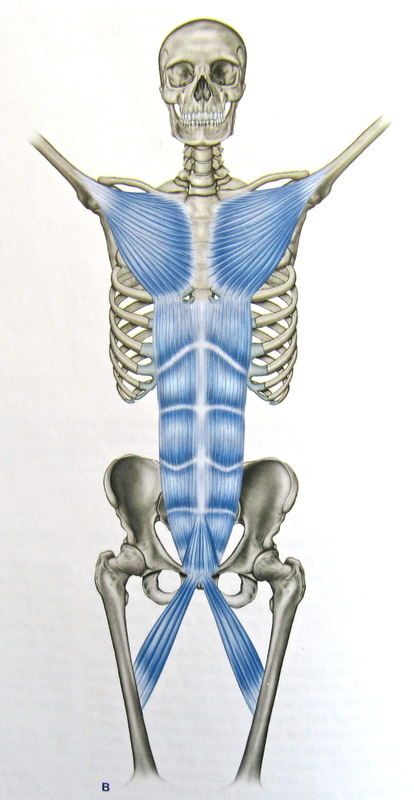 Notice that the fibers of the latissimus dorsi and thoracolumbar fascia on one side follow the same trajectory as the contralateral gluteus maximus. 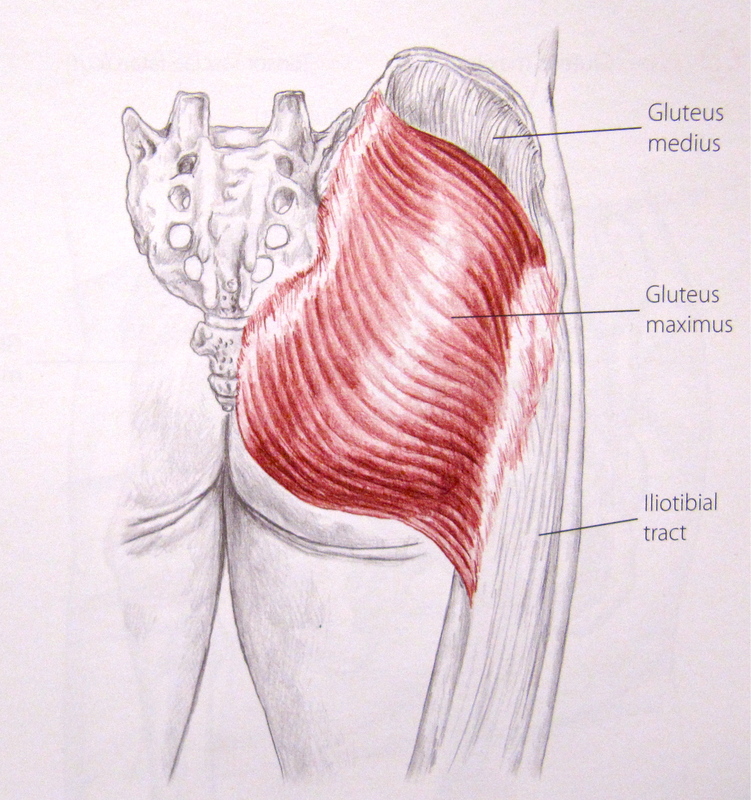 The gluteus maximus takes off from the sacrum, coccyx and posterior iliac crest (hip bone), runs diagonally down and across the buttock and attaches to the upper femur and the fibrous iliotibial tract. The vastus lateralis is one of the four muscles making up the quadriceps femoris, the largest muscle in the body. It starts its journey at the upper femur right where the gluteus maximus comes to an end and proceeds to run down the lateral thigh, terminating at the upper shin bone just below the knee cap. The following image depicts the elements making up a line that connects the hand, shoulder and rib cage with the contralateral pelvis and leg – this time along the front surface of the body. Myers named this chain the Front Functional Line. This time, on the left side, the sequence begins with the origin of the left pectoralis major at the upper left arm, runs with the pectoralis onto the chest, continues down the abdomen with the rectus abdominis to the pubis, and then crosses over to the right leg by means of the adductor longus. Of course, the right arm connects to the left leg in the same manner. Once more, two lines intersect as they cross the torso to connect one arm with the contralateral leg. 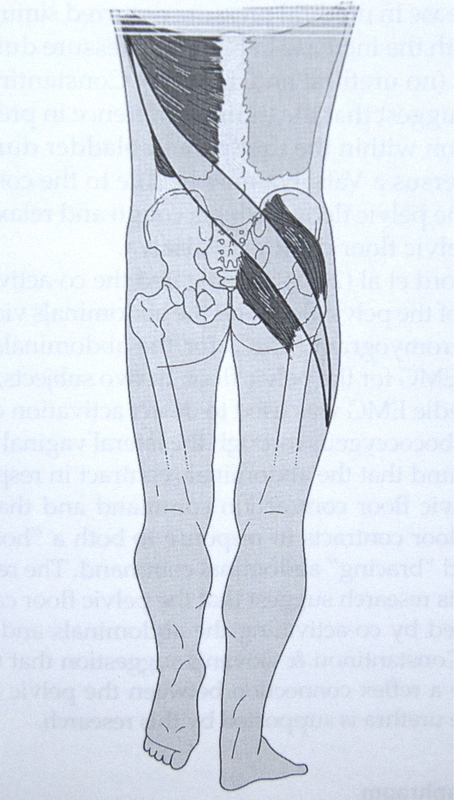 The anterior oblique sling is shown below. Described by Diane Lee and Andrew Vleeming, it is clearly similar to the central portion of the Front Functional Line. Opposite lines often work in reciprocity, one lengthening while the other shortens. The anterior oblique slings are doing this in the photo below. As we look briefly now at the links in this chain, recall that the pectoralis major runs from the front of the humerus to the medial half of the clavicle, the sternum and the cartilage of the first 6 ribs. Starting from the chest wall at the cartilage of ribs 5,6 and 6, the rectus abdominis picks up from where the pectoralis major left off and travels down the front wall of the abdomen to the pubis. 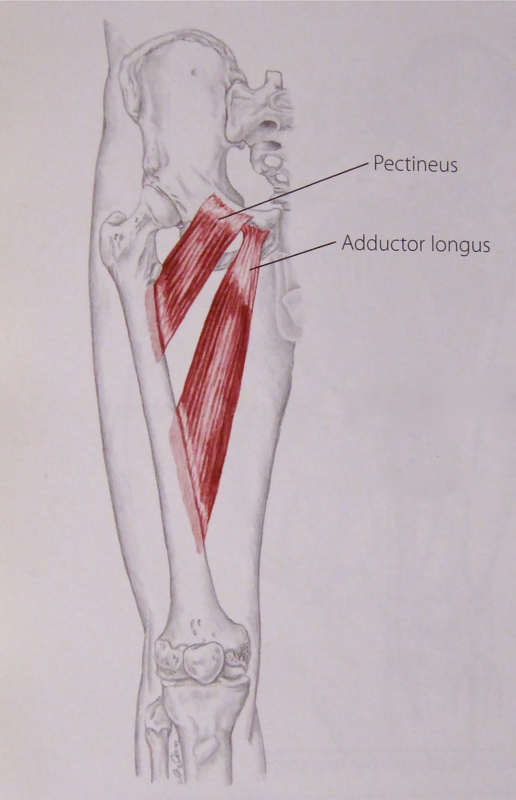 At the pubis, the adductor longus takes over from the rectus muscle, crosses the midline and attaches to the inside edge of the femur that is opposite to the hand where the line commenced. As before, each hand connects to the contralateral leg. Thus, front and back, there are big tendons or myofascial lines that provide added strength and precision to the movements of the limbs by connecting them across the body to their opposite. Left upper with right lower and left lower with right upper. In this way, the trunk adds its power to that of the limbs. The final drawings show these lines in action as someone prepares to throw the javelin. Imagine how these lines are similarly activated as we open up in Brush Knees. There are differences, of course, partly because the javelin thrower is leaning back as he prepares to release the javelin. In Brush Knees, the torso remains more upright and the front hand has the same amount of intention as the back. In the west, we have tended to study a muscle, joint or region of the body in isolation. This does provide rich details about how a part functions on its own. But it does not reveal how the parts work with one another to ensure that the organism as a whole functions well. Whatever muscle, tendon and bone may do on their own, they are also bundled into precise sequences that establish specific lines of force and structure. To respond when things fall apart, we need to know how they are meant to work together. The concept of one big tendon helps us grasp how the hands, head and feet are linked. How the body maintains global stability while moving, and retains flexibility while creating strength. In the last few articles, we have examined a few of the body wide continuities that form, dissolve and then reappear as we make our way through the world. There are others. Just remember they exist. Look for them as you move and use your practice of the Taoist Tai Chi™ internal arts of health to help keep them soft and robust.